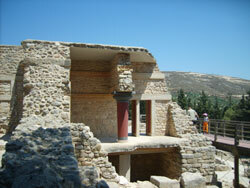 Knossos lies a few kilometres off the island’s capital, Iraklio. It is the most important of all the island’s archaeological sites, and has been world famous since its discovery at the end of the 19th century. The costly excavations by Sir Arthur Evans at the beginning of the 20th century even involved rebuilding areas of the palace - modern-day archaeologists regard this as a monumental blunder, since the recreated areas of the palace only reflect Sir Arthur Evans’ vision of Knossos. 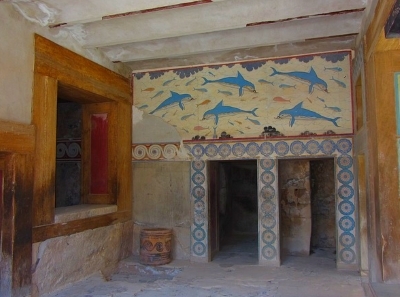 Many visitors to Knossos find these recreated parts of the palace the most interesting to look at. As a layman, there’s far more of interest at Knossos than in the other three Minoan palaces (Phaistos, Malia and Kato Zakros). Getting to Knossos: Knossos is easily reached from the Iraklio’s bus station. Simply take bus number 2 (city bus line which runs 3-5 times an hour) until it reaches its final stop: Knossos. The public buses are cheap. In 2019 the bus will be only around €1.50 one-way. The buses from Iraklion bus station to the minoan Knossos Palace ran daily in the saison at least from from 8am through to 7pm; in winter this was scaled back to 8am to 5pm. Be careful, there are 2 bus-stations in Iraklio. The bus to Knoosos leaves from Bus-Station A. All buses to the East of Crete (Malia, Agios Nikolaos, Sitia, Ierapetra...) also leave from this station. Admission Charge Knossos: The entrance fee to the palace is unfortunately significantly much higher than a few years ago.. The cost of admission is now, in beginning 2019, 15 euros per person. Our tip: There is an entrance ticket in combination with the famous Archaeological Museum of Crete in Herkalion for only one euro more (16 Euro). 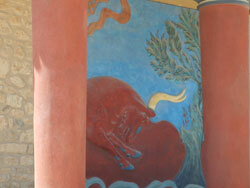 Opening hours Knossos: In summer, the palace is open daily from 8am to 8pm. This information is from the year 2019. In the winter 2018 / 2019 the opening times of the palace of Knossos were open from 8am to 5 pm. The tavernas and shops around the palace are mostly expensive and medium-quality. How many hours you spend in the palace of Knossos depends on your interest in archaeology, your imagination and knowledge of the history of this palace.